For two and a half years, Eva Ruiz Gomez was the subject of a groundless prosecution by the Monterey County District Attorney’s office. The criminal charges against her–for felony kidnapping of her own son, who she previously had full legal custody of–were based on a court order which, though fraudulently obtained in Family Court, had changed that custody status without her knowledge. 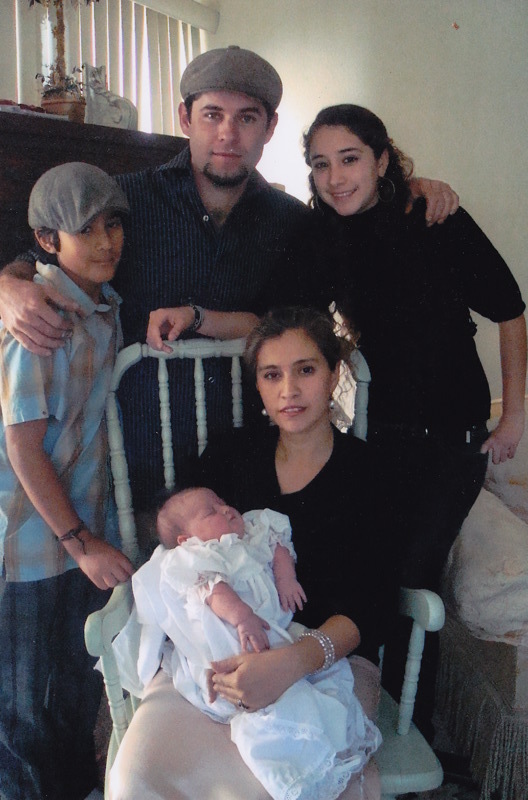 As a result, Eva was arrested on Sept 28, 2010, and her 12-year-old son was taken from school by the DA’s investigator, interrogated and then handed over to his biological father, Ramon Munoz, a man who was previously ordered by the Family Court to have visitation only when supervised by a police officer, because of his extensive history of criminal convictions. Eva was arraigned nine times from Sept 2010 to Jan 2012, and the DA made five different accusatory pleadings but still could never coherently explain how Eva had violated any order. Meanwhile more and more people heard about Eva’s case, and many began accompanying her to the almost endless court hearings—sometimes as many as one in Criminal Court and one in Family Court per week. By 2012, a letter writing campaign and online petition had been launched urging DA Dean Flippo to dismiss Eva’s case in the interest of justice, reporters from three local papers began to cover her hearings, a march and rally by her family and supporters was covered KSMS evening news, and the Mexican Consulate’s Honorary Consular Blanca Zuarez began attending hearings and speaking to the media on Eva’s behalf. 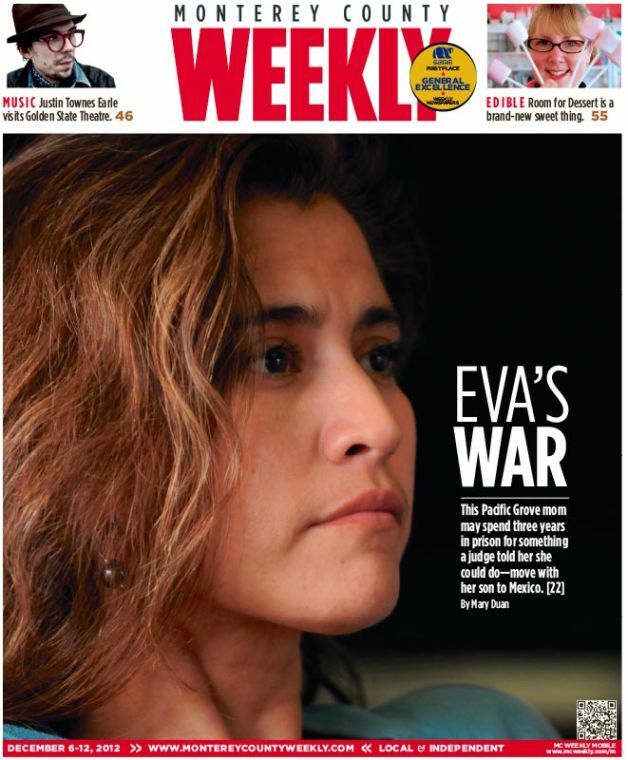 Three times Eva’s story was featured on the Monterey Herald’s front page by Claudia Melendez, and Monterey Weekly editor Mary Duan wrote the cover story on Eva’s case for their Dec 6, 2012 issue. What was it about Eva’s case that drew so much attention? Why did people, who previously had not know Eva, accompany her in court and rally behind her cause? In 2002, Eva was given sole legal custody of her son Enrique and permission from the Monterey County Family Court to move with him to Mexico. Ramon Munoz was ordered to contact mediation in May 2003 to arrange for visitation in Mexico. He failed to do that, and by the time Eva and her family moved in Oct 2003, no visitation had been ordered in Mexico. During the six years Eva and her family were living in Mexico, Eva was unaware that Munoz, with the help of the DA’s investigator, had manipulated the court in August 2004 to change the custody and visitation orders. Munoz was then able to file kidnapping charges against Eva, and together Investigator Infante and Munoz opened a child abduction case. But between 2004 and 2010 they never contacted Hague Convention, the American Consulate, the FBI or the Mexican authorities. Ramon Munoz, Eva’s former boyfriend and the complaining witness in the case against her, had no credibility and had lied to the court on many occasions–which Eva and her lawyers have proven –including making other false kidnapping charges against her in the past. Rather than credibility, he instead had the collaboration of the Monterey County DA’s investigator, Manuel Infante, and the assistance of his sister, Monterey County Deputy Sheriff Anna Hernandez, who used her position of authority more than once to contrive false charges against Eva–all which is well-documented. Of course legally Eva should have been personally served and given a hearing at which to respond to any request to change custody. She was not served; she was living legally in Mexico, unaware that this hearing was taking place. But, without her present, and even though Munoz informed the court (according to court transcripts and his declarations) that Eva was residing in Mexico, in August 2004, Family Court Judge Kay Kingsley gave him joint custody and a visitation schedule with drop off and pick up at the Seaside, CA, Police Station! Munoz specifically asked for this location, the police station where his brother-in-law, Anna Hernandez’s husband, worked. Then in 2005, Munoz, again with the assistance and instructions of Infante (according to court transcripts and Munoz’s declarations) was able to get the child support cancelled, even after Judge Adrianne Grover repeatedly told him Eva must be personally served before any child support changes could be made. At stake were arrearages of approximately $30,000 (as officially acknowledged by the court in 2013), which Munoz surely must have known he would never have to pay if Eva was convicted of kidnapping and serving time in prison. Eva and her husband, Ismael Garcia, opened a bed and breakfast. Eva enrolled her son and daughter in school, registered them with the Mexican government as well as with the CA Secretary of State, and advertised their business online, with Eva’s name and numerous phone numbers, including a local Monterey number. In May 2009, when the U.S. economy collapsed, so did their business, and Eva and her family returned to Monterey County for a temporary stay. She and her children have dual citizenship. On Sept 28, 2010, Eva’s 12-year-old son Enrique was taken without notice from Carmel Middle School by the DA’s Investigator Infante and interrogated, without any child advocate present, before being handed over to Munoz in Salinas. Immediately after Enrique was taken, a terrified school secretary called, giving Eva the name and phone number on Mr. Infante’s business card. When Eva reached Infante, she was told to come to his office in Salinas and he would tell her where her son was. When Eva arrived with her husband and baby, she was arrested, suffered a series of severe convulsions, was handcuffed to a gurney, transported by ambulance to the emergency room, then handcuffed to a hospital bed and then transferred to the jail once her condition stabilized. Eva has a potentially life-threatening autonomic nervous system disorder, which includes serious symptoms that can be triggered by crises or extremely stressful situations, like being falsely accused of a crime, arrested and her son taken. 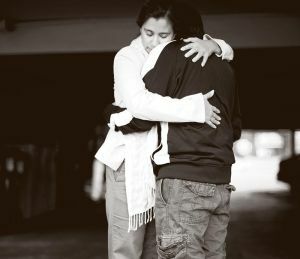 Eva was bailed out the next morning and frantically began looking for an attorney to help her get her son back. She had no knowledge of where he was and wasn’t allowed any contact with him, as ordered by the court. It was two weeks before a Family Court hearing was scheduled and, at that hearing, Judge Thomas Wills ordered that Enrique be immediately returned to Eva. The following day, despite this Family Court ruling, DDA Amy Patterson attempted to have Eva re-arrested and have her bail forfeited for having contact with her, claiming doing so put Eva in violation of her bail conditions. This abduction of Enrique from school by Investigator Infante, as well as Eva’s arrest and jailing, were based on that fraudulently obtained court order issued in 2004 when Munoz, without having Eva served, had filed the motion to change Eva’s sole custody to joint custody and obtain visitation in Monterey. Immediately after Eva’s arrest, Munoz took Enrique to the DA’s office for interrogations repeatedly. This continued for weeks until a Family Court judge ordered Munoz to stop, and shortly after that the judge completely terminated visitation. It was reported by three different court-appointed therapists that Enrique was suffering from PTSD, and his pediatrician, as well as two other medical doctors, gave the same diagnosis. But the courts appeared to be more interested in prepping Eva’s son for trial—he was their key witness—so it seemed that they needed him to bond with his biological father, the complaining witness in the criminal case. In place of visitation, Enrique was then forced to attend weekly “reunification therapy sessions” with Munoz, which only traumatized the boy further. After Enrique consistently refused to attend or cooperate with these sessions, the therapists—in front of witnesses—threatened Enrique that if he didn’t cooperate, his mother was going to be in serious trouble. Meanwhile Eva was, as ordered by the court, paying these therapists hundreds of dollars a week, which—on top of other court expenses—meant the family often went without the basics. Over the first year and a half after Eva’s arrest, she retained and paid three lawyers, who each urged her to plea bargain—even though they each acknowledged she was innocent—and one refused to continue representing her unless he was paid tens of thousands of dollars up front. For two years after Eva’s arrest, she and her lawyers asked to see an arrest warrant, but none was on record at the Sheriff’s Dept or provided in Discovery from the DA’s office. If a warrant was in fact issued on the basis that Eva violated a fraudulently obtained court order, then it appears to have been issued without legal justification. It seems apparent the 2004 order was the basis of her son’s abduction from school, her wrongful arrest and imprisonment, charges against her for violations of custody and visitation, and the two and a half years of legal torture that ensued–including 70 hearings in Criminal Court plus that many in Family Court as well. Clearly it was the intention of the DA’s office, with full cooperation from the courts, to drain Eva of all resources so that she would plea bargain, but she continuously refused, because she wasn’t guilty. Finally in the spring of 2012, Eva found two lawyers, from out of county, who agreed to take her case pro-bono. They were outraged by the collusion between the Family Court, Criminal Court and the DA’s office, the police misconduct, the perjury by the DA’s investigator, and much more—all which they were able to document and file with the courts. Their research revealed that the DA’s office violated two treaties: 1) the Memorandum of Understanding between Monterey County and the Consulate General of Mexico, and 2) the Vienna Convention on Consular Relations. In 2012, they filed on Eva’s behalf a Pitchess Motion, a Murgia Motion, an appeal with the 6th Appellate Court and a Writ with the CA Supreme Court. They filed a 995 Motion to Dismiss and, after many months, were granted a hearing. On January 25, 2013, Judge Larry Hayes, after having read the court documents and heard the oral arguments, dropped all charges and dismissed the case in a courtroom of friends, family, the Mexican Consular and newspaper and TV reporters. Judge Hayes carefully detailed why he was dismissing the charges against Eva but referred only to the 2002 and 2003 orders that were issued before she and her family moved to Mexico. He did not mention the 2004 order (the basis of her arrest and prosecution), probably because the DA had been forced to change the charges against her numerous times after judges in both courts acknowledged the 2004 order was invalid. As DDA Todd Hornik quickly exited the courtroom following the dismissal, he told the press that this was a civil dispute that should have never left Family Court. (Of course that begs the question: then what was the DA’s office doing all that time?). On Sept 4, 2014, the invalidity of the 2004 order was finally ruled on, because Eva— acting as her own counsel—filed a Motion to Vacate, and that motion was granted. 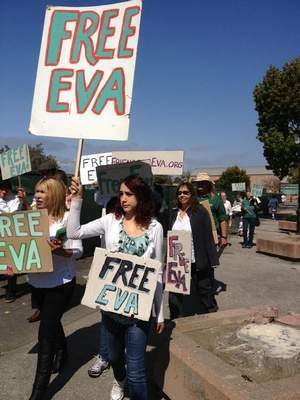 That ruling restored Eva’s sole legal custody, and for the first time since Sept 2010, Eva and her son could travel freely outside of Monterey County. Eva was unable to work during the two and a half years she was fighting charges in Criminal Court, and at the same time constantly defending her son and herself against Munoz and his lawyer in Family Court. Their family’s savings was soon wiped out, and they are now deeply in debt. Through this website and through mutual friends and family, Eva has been contacted by women in similar situations to hers and asked for help. Because of Eva’s experience with both court systems, she been able to share what she’s learned, accompany them at hearings and lend support. Seeing that there is so much need for such advocacy work, Eva and others are interested in starting a non-profit to do just such work. Many who repeatedly accompanied Eva to court hearings and supported her throughout this long and painful ordeal, share her concern that there’s been no consequences for what the DA’s office did. If there were consequences, perhaps the county would think twice before doing this to someone else. The long struggle to get the criminal charges against Eva dismissed was a community effort, and that community is still waiting for justice to be served.